Vitreous carbon and carbon (graphite) planchets are ideal substrates for X-ray analysis and backscattered electron imaging in a SEM or electron microprobe. The spectroscopically pure carbon discs provides an excellent conductive, low emission X-ray background free of any characteristic X-ray peaks except carbon. Carbon planchets are favored over the non-conductive diamond planchets (charging will have negative effects on the analytical results and can distort X-ray mapping and imaging). The vitreous carbon and carbon (graphite) planchets can be cleaned and used again. For fine powders and imaging applications the vitreous carbon is the best choice. For X-ray applications of larger particles or specimens or for applications where the planchets can not be used again, the carbon (graphite) planchets are adequate. Lapped surface on one side for smoothness, also known as glassy carbon or glass-like carbon. For analytical SEM/EDX, X-ray analysis and chemical analysis applications. High purity vitreous carbon with impurities less than 30ppm total. 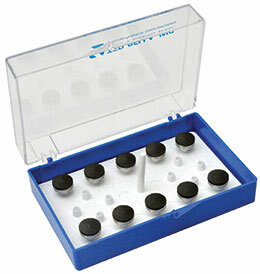 Spectroscopically pure carbon Grade 1 (graphite) planchets with total impurities equal to or less than 2ppm with each single element 1ppm or less. Trace elements can be Si, Al, Fe, Mg, Ca or B. The carbon discs have a fine ground finish on one side; 0.80µm (32µ inches). All carbon planchets are 1.6mm (1/16") thick. Sizes from 10 to 32mm diameter to fit all styles of SEM pin and cylinder mounts varying from 10 to 32mm diameter. The highly polished carbon planchets have a smooth, virtually mirror finish on one side with a surface roughness of 0.05 to 0.01um. The material for the cabon discs is spectroscopically pure carbon Grade 1 (soft graphite) with total impurities equal to or less than 2ppm with each single element 1ppm or less. Properties same as Carbon Planchets above. The polished planchets are 1.4 to 1.5mm (0.55" to 0.06") thick. Available in the popular 12.7mm (1/2") and 25.4mm (1") diameter. Carbon planchets with a 1.6mm thickness mounted on standard pin stubs, supplied in the #16709 pin mount storage box. Convenient and ready to use. Provides a durable and economical solution for SEM/EDS microanalysis or low emission surface backscatter imaging applications needing light element surface. Surface roughness of the carbon discs is 0.05-0.01um, material is spectroscopically pure carbon with total impurities less than 2ppm. The aluminum stub underneath the carbon disc provides more rigidity that the carbon stubs. Available for 12.7, 18 and 25.4mm (1/2", 0.7" and 1") pin stubs. Sold in storage box with 10 of the 12.7mm pin stubs and 8 of the 18 or 25.4mm pin stubs.